Though my poetry often varies in structure, setting, and narrative style, I cannot help but write about the themes that have haunted me since childhood. Love. Family. Grief. Emotional distance. Perhaps all authors, regardless of genre, are in some sense trying to better know their demons, their ghosts, all while exploring and perhaps even celebrating the fear that caused them. In my case, I’ve always been enthralled by the contrast of love and mortality, how the more we love the more we have to lose, and how different people react to highly charged emotional situations. In one form or another, I’ve explored these themes for years in both poetry and short fiction. Most of the time I approach these emotional moments from the safety of distance. As authors, we tend to step back a bit from directly experiencing these emotions in order to let our characters or plots or poetic images speak for us. But when composing my latest poetry collection I tried something a bit different. I opened myself up in a far more personal and direct way. I didn’t just want to explore these themes as concepts, safely from that writerly distance, but as honest reflections of my own experiences. Disinheritance was inspired by a few pivotal moments that occurred within a few months of each other, namely the illness and passing of my mother, a terrible miscarriage, and my wife and I’s struggle to move forward and redefine the landscape of “family”. Given the immediacy and power of these situations, I found it difficult not to examine them creatively. For about six months, I wrote about these experiences daily and with a singular focus. But at the same time, I didn’t want to limit myself by writing exclusively in the first person. Instead, to explore grief more fully, I adopted various unique voices, like those of our miscarried child, the hypothetical boy he might have grown up to be, my mother in her last moments, and my wife as she struggled to cope. Each of these “characters” has their own voice, their own fears, their own needs, and taken together, after reading the entire collection, a more dynamic portrait of longing and tragedy and joy emerges. 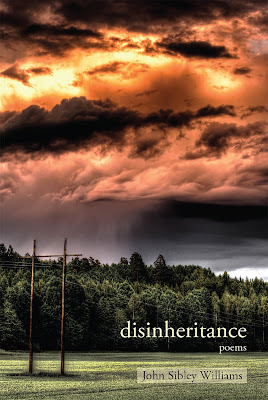 So, Disinheritance shows a far more personal side than most of my poetry, though the poems also speak to larger, universal human concerns about how we approach mortality and what roles we play in each other’s’ lives. And I am honoured and lucky to have been able to read a few of these poems to my mother in her final days, though she will never see the book’s publication. John Sibley Williams is the editor of two Northwest poetry anthologies and the author of nine collections, including Disinheritance and Controlled Hallucinations. A five-time Pushcart nominee and winner of the Philip Booth Award, American Literary Review Poetry Contest, Nancy D. Hargrove Editors' Prize, Confrontation Poetry Prize, and Vallum Award for Poetry, John serves as editor of The Inflectionist Review and works as a literary agent. Previous publishing credits include The Midwest Quarterly, The Massachusetts Review, Poet Lore, Columbia Poetry Review, Mid-American Review, Third Coast, Baltimore Review, Nimrod, RHINO, and various anthologies. He lives in Portland, Oregon. A lyrical, philosophical, and tender exploration of the various voices of grief, including those of the broken, the healing, the son-become-father, and the dead, Disinheritance acknowledges loss while celebrating the uncertainty of a world in constant revision. From the concrete consequences of each human gesture to soulful interrogations into "this amalgam of real / and fabled light," these poems inhabit an unsteady betweenness, where ghosts can be more real than the flesh and blood of one's own hands. Disinheritance is available to buy now. What are your opinions on writing from grief and emotional experiences? Let me know in the comments below.